Hollywood’s newfound ability to create movies completely through computers has given birth to one of the most unlikely and diverse movie genres we have ever seen, a form of expression mainly aimed at catching the eye of technology fans, yet also responsible for garnering a young audience for its likeness to standard animation. Whether that resemblance was an intentional move on the parts of studios who first jumped at the technique is something we will never know for sure. For years prior to the evolution of cinematic technology, it had been a heavily-discussed topic regarding the future of the moviemaking process, essentially founded on the notion that the eventual benefits of it would allow studios to create films that seemed so close to standard live action, there would no longer be a need for actors and, thus, large movie budgets. But those claims appear to be founded on naive idealism; the computer is as powerful as we never imagined, and it is still too early to successfully replicate the realism of living, breathing actors. That doesn’t mean it can’t eventually be done, but it leaves many wondering what studios can do in the meantime. Now that the cinema is blessed with releases like the recent “Final Fantasy: The Spirits Within” and “Shrek,” likely the best movie of 2001, few, if any, of us will mind Hollywood’s inability to recreate life on the computer screen. 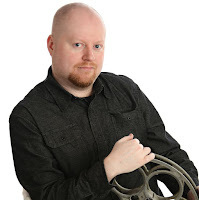 We are in an age where a new, exciting realm of entertainment has been conceived (perhaps totally by accident) utilizing the current possibilities of CGI effects, matched with the minds of those who have kept the flat but surviving world of routine feature animation consistently fresh for all these years. The results so far have been completely ingenious; while backgrounds have an authentic and undoubted presence, the objects and characters who occupy the space retain that cartoonish, silly edge as seen in normal animation, only with seemingly more dimension, symmetry and freedom. “Shrek” takes these traits to heart and rushes off the screen at top velocity. It is one of the most delightful, charming, imaginative and superlative endeavors that computer animation has offered since the original “Toy Story,” sprawling with so much appeal and color that you are left marveled by its appearance. Where even highly successful computer-generated movies can lack in the plot department, though, here is a film that also pounces with a witty, introspective and magnificent script designed (pardon the cliché) to amuse both the child audience as well as the adult audience. And yet beyond its irresistible urge to poke fun at the obviousness of the fairy tale world, there lies an important moral regarding the difference between appearance and personality, and how no single judgment can always be projected on both traits. The story is set on the title character, a tall green ogre named Shrek (voiced by Mike Myers in a Scottish accent), who lives a life of solitude deep in the swamps, where he bathes in mud and uses his ear wax to create candlelight at the dinner table. It’s not that he is forced into this rather drab living arrangement, however; he simply enjoys being alone, and feels the outside world misunderstands him because of his looks. But company comes a-knockin’ on his door when the vain, cowardly Lord Farquaad (John Lithgow) banishes every fairy tale character from his kingdom and sends them into the swamplands. Among those who have been exiled are some familiar faces many a child have grown up with in bedtime stories: the Three Blind Mice, the Seven Dwarfs, the Three Bears, the Big Bad Wolf, and even dear old Tinkerbell. Shrek, however, is rather annoyed by the abrupt arrival of all these people in his neighborhood; at one point he even shouts “Get that dead broad off the table!” when he sees Snow White slumbering in his cabin. Following a meeting in which a loudmouthed donkey (Eddie Murphy) determines to make an uninterested Shrek his new best friend, the green ogre then decides to take matters into his own hands, making his way up to the prince’s castle to demand that the fairy tale folk be allowed back into the kingdom so that he can maintain his solitude. Farquaad strikes a deal with Shrek which would allow the banished creatures to return home, but only when the beast can manage to rescue a princess guarded by a fire-breathing dragon and bring her to his castle. The reason: Farquaad wants to be promoted to king, but the only way for him to do so is by selecting a bride to serve alongside him. The prince is initially given three women to choose from (all through the style of “The Dating Game”), but the imprisoned Princes Fiona (Cameron Diaz) is the only logical choice compared to the other eligible maidens: Snow White, who is dead, and Cinderella, who is merely a peasant. So begins a journey in which Shrek and Donkey (who joins the crusade against the ogre’s wishes) set out, rescue, and deliver the Princess Fiona, a damsel in distress who is not the pushover that most fairy tale heroines are, and a woman who isn’t afraid to get physical with her enemies when the time calls for it (a few of the movie’s most memorable shots are of her replicating the bullet-time fighting moves of “The Matrix”). Needless to say, everything that follows is not of standard fairy tale formula, as Shrek and Fiona grow quite fond of each other (a la “Beauty and the Beast”), ultimately leading up to a sweet but offbeat resolution in which the audience is left with a valuable lesson to mull over. 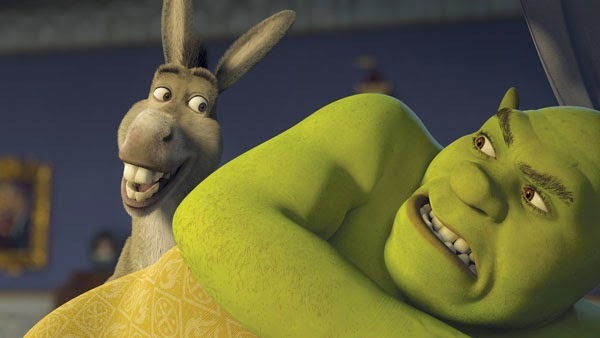 “Shrek” can be credited with incorporating simple but hilarious sight gags to keep the younger audience amused, but the bulk of the script is a series of in-jokes, making fun of all kinds of sources that have revolved around fairy tales and their obvious formulas (which will be the primary attraction to older viewers). Almost nothing is safe from the writers behind this screenplay, who take jab after jab at the brothers Grimm, Aesop, and even the Disney studio itself, arguably the primary source for screen treatments of classic stories like these. It’s not hard to see why the movie follows this route: Dreamworks’ head of animation, Jeffrey Katzenberg, was once the president of the same department at the Mouse House, until he was ousted for reportedly not seeing eye-to-eye with the higher powers. The many subtle gags directed towards the studio include a reference to Michael Eisner (who, as rumor has it, actually serves as the model behind the Lord Farquaad character), and a castle that features elements resembling the Magic Kingdom (such as souvenir stands and singing animatronic figures who look and sound like leftovers from the “It’s A Small World” attraction). There is a lot of material that I have not discussed here, but maybe that’s best. “Shrek” is the kind of movie that seems so much more special when the jokes play out with no prior knowledge of their existence. And though the movie is only 90 minutes long—relatively short for a movie so filled with probing satire—it never ceases to raise our eyebrows, drop our jaws, or leave us smiling. Funny, poignant, endlessly amusing and beautiful, this is the kind of picture that makes us happy to be moviegoers.